Lost and Found items left in the Workshop will be placed in the cabinet near the Greeters Desk for a short time. Those items not claimed will be delivered to LWV Security, c/o Watch Commander’s Office, to await recovery claims by the owners. Wearing apparel is left on the clothes pole for a week and then taken to Security on the 1st floor. If there is a name on an item (flash drive, CD-ROM, or other removable drive etc. ), a Greeter will call the forgetful person to come and pick the item up. There is a sign on the door reminding people to be sure to take their personal possessions with them when they leave the workshop. 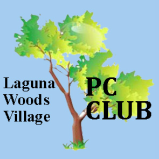 If you have left any personal items at the workshop, please pick them up any Monday through Friday between 10 a.m. and 4 p.m. or Saturdays between 10 a.m. and 1 p.m.
​If you have any questions, please call the PC Workshop at (949) 268-2262.